St. Croix Catholic School (SCCS) is a consolidated Catholic school, educating PreK children through grade 8. The school is located adjacent to St. Michael's Catholic Church in the town of Stillwater, a beautiful community in Minnesota's St. Croix River Valley. 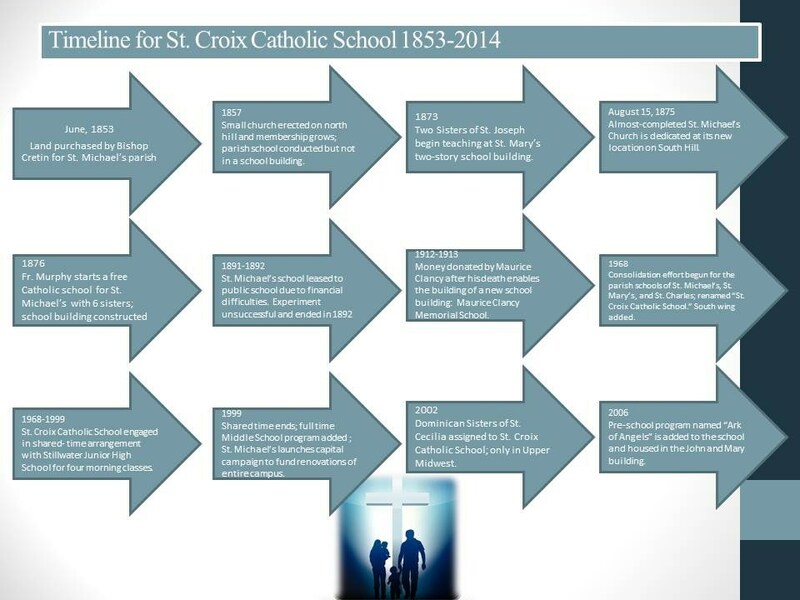 Catholic education has been a beacon in the St. Croix Valley for nearly 160 years. In 1856, three years after the establishment of the parish of St. Michael, the church began educating immigrant families at its founding location on the North Hill of Stillwater. Between 1870 and 1880, the church and school locations were moved to the present location on South Third Street. The school building on this new site was not well constructed. In 1913, Maurice Clancy, a wealthy Irish widower with no heirs, left his estate to St. Michael’s School with instructions to construct a new building. This school building is still used today and proudly stands as the heart of the school campus. In 1959, a twelve-classroom wing was added on to accommodate a growing school population. It may seem redundant that within several blocks of the St. Michael’s Church and school another church and school would be built in the late 1880s, St. Mary’s. This can be explained by the differing attitudes of the immigrant groups. St. Michael’s served Irish Catholic immigrants, while St. Mary’s served the German Catholics. The St. Mary’s German Catholic School opened in 1872 and was operated by the Sisters of St. Joseph of Carondelet for ten years. 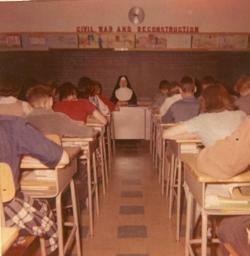 In 1882, however, the Benedictine nuns from St. Joseph, Minnesota took over the operation of the school. Between 1882 and 1968, the two parishes operated two distinct schools. This arrangement continued until an illness of the principal of the St. Mary’s School in 1968 resulted in a shared staff arrangement with St. Michael’s School. The benefit of sharing resources was noted by the two parish communities. Therefore, in March 1968, a consolidation effort began. St. Charles Church in Bayport joined this consolidation. The purposes of the consolidation were to give the students a wider variety of teachers and resources, to provide the students with single grade classrooms, to offer the students more programs and competition, and to provide a physical education program. 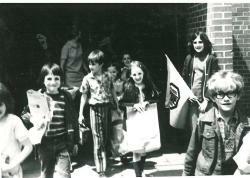 The consolidated school for students in grades Kindergarten through 8th grade became known as St. Croix Catholic School. It was also at this time that a shared-time arrangement was sought with the public school system. Since the St. Michael’s school building could not provide facilities deemed necessary for a full choice of courses at the junior high level, a system of sharing resources was adopted. From that time, until the 1998 – 1999 school year, students took home economics, industrial technology, science, and instrumental music at the Stillwater Junior High School in the morning hours. They received instruction in their academic courses and religion at St. Croix Catholic School. This cooperative arrangement between the public and private schools served the students well; however, as St. Croix Catholic School grew and Stillwater Junior High School moved to a new location, the scheduling and transportation arrangements for such an arrangement became more complicated. As an answer to this, in the fall of 1999, a full-time middle school program was added to St. Croix Catholic School. At this same time, the Church of St. Michael, which owns the school buildings, was planning a building improvement project for the Church and it was logical to include expansion of the school to accommodate the new full time middle school as well as needed upgrades to the K-5 program. In fall of 2001, a building expansion and remodeling that included nine new classrooms, a middle school commons, and a new gymnasium and theater stage was completed. In 2006, a preschool program, Ark of Angels was added to the tri-parish’s Catholic education mission. Ark of Angels resides in the John & Mary building.